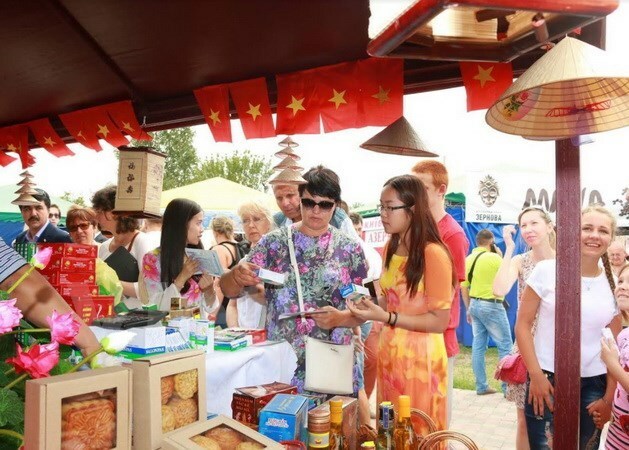 Moscow (VNA) – Vietnamese businesses participated in the traditional trade fair Sorochinsky Yarmarok in Poltava province of Ukraine, which has been held annually since the eighteenth century. The Vietnamese business delegation was led by Kieu Ha Lien, Counsellor of the Vietnamese Embassy in Ukraine. This year, the Embassy of Vietnam worked with Vietnamese businesses in Ukraine and Vietnamese communities in Kharkov and Kiev cities to promote Vietnamese good at the fair, which began on August 22. On display at Vietnam’s booths were traditional farm produce and foods, herbal medicine, handicrafts, and cultural and tourism products. Vietnam has participated in the fair since 2015 and its booths have drawn many visitors, who came to learn about the country’s products. This year’s fair drew more than 1,000 businesses, small traders and craftsmen, who presented various commodities such as industrial products, handicrafts and souvenirs.